The Footer is a line or block of text that displays at the bottom of each page. 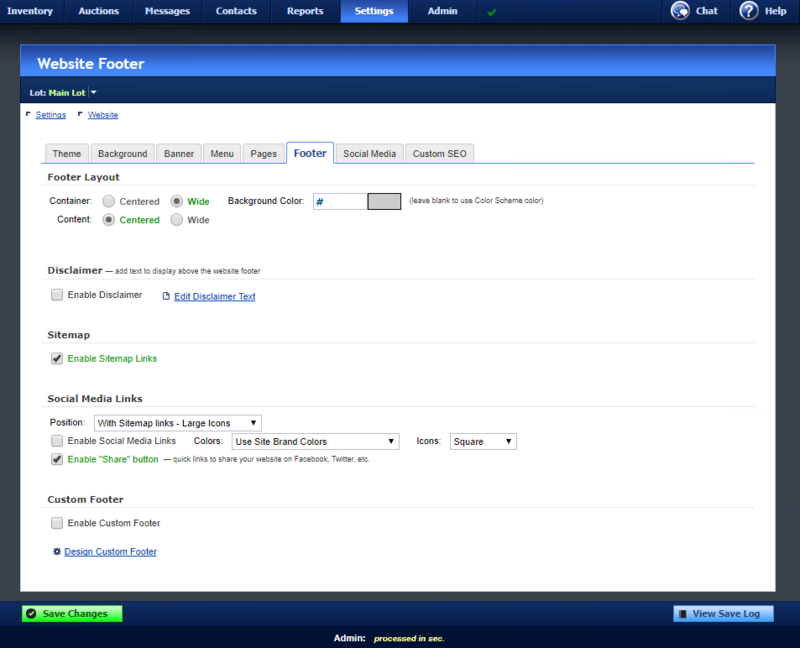 To locate the Footer Settings, navigate to Settings -> Website -> Footer. You can choose whether your footer container and content should be Wide (covering the full width of the screen) or Centered. You can also set a background color for your footer container. To add a Disclaimer that will be displayed at the bottom of every page, check Enable Disclaimer. Click Edit Disclaimer Text to enter the text to display for your disclaimer. This text will be displayed below your web page content, above your sitemap links. This section will display links to all of the active pages on your website. Social media icons might also be displayed here, depending on your settings. Links to any pages you have enabled are displayed at the bottom of every page of your site. You can also enable additional Social Media links, and enter Disclaimer text. You can enable links to your Social Media accounts, and choose the color and style for the icons. You can also enable a “Share” button to allow visitors to quickly share your website on their social media accounts. The Social Media icons can be displayed your Sitemap, using Large or Small icons, or displayed at the bottom of the page, aligned to the left or right.